Imagine a university where scholars, artists, and designers find the support they need to challenge convention and fearlessly create positive change in the world. • Parsons offers a total of 36 graduate and undergraduate programs. • Students at The New School come from all 50 US states and 118 foreign countries. • Parsons is located in historic Greenwich Village in New York City and in Paris, France. • Students can apply to study at art and design partner schools in Europe, Asia, Latin America, and around the world. • Parsons established the first degree programs in the United States in Interior Design, Advertising and Graphic Design, and Fashion Design. Imagine a community where walls between disciplines are dissolved-—where journalists collaborate with designers, architects with social researchers, media specialists with activists, poets with musicians. Imagine an intellectual and creative haven that never has, and never will, settle for the status quo. Leading The New School’s commitment to design-inspired thinking is one of the largest and most prestigious art and design schools in the nation: Parsons School of Design. Parsons offers undergraduate degree programs in New York City and Paris-—two of the world’s epicenters for innovation and creativity. Students are enabled to develop the knowledge and skills needed to succeed in a rapidly changing society through collaboration with peers, industry partners, and communities around the world. More than 1,150 full- and part-time faculty teach at Parsons, all of them successful professionals in their fields. And the students hail from more than 65 countries and every possible background-—bringing a truly global perspective to classes. At Parsons, the diverse community of students develops critical-thinking skills and applies them to challenges ranging from environmental degradation to physical accessibility and humanitarian crises. Through a network of interconnected design laboratories, students explore global phenomena at multiple sites and scales of engagement, from on-campus research initiatives to partnerships that effect change in New York and around the world. In any discipline you choose at Parsons, you will find your course work both rigorous and rewarding. Students and faculty work side-by-side in studios and labs to fulfill creative visions and design master works of art in Parsons’s undergraduate programs in Architectural Design; Art, Media, and Technology (Parsons Paris only); Communication Design; Design and Technology; Fashion Design; Fine Arts; Illustration; Integrated Design; Interior Design; Photography; Product Design; and Strategic Design and Management. The New School’s New York City location offers access to hundreds of cultural opportunities, including museums, concerts, theaters, restaurants, parks, and the streets themselves. The New School believes that students learn both in and out of the classroom. With access to a wide array of internships and apprenticeships with top designers, students can shape their education and take advantage of all the University and the city have to offer. Current and past internships include Marc Jacobs, The Colbert Report, HBO, MTV, The New York Times, The New Yorker, Rolling Stone, Marvel Comics, and the Museum of Modern Art. 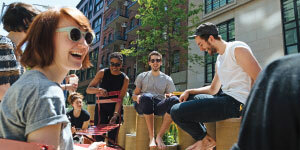 The BA/BFA program at The New School is a five-year dual-degree program through which students can earn a liberal arts BA from Eugene Lang College of Liberal Arts and a BFA from Parsons School of Design. As college approaches, they face a choice: focus on their art or get a liberal arts education. Instead of picking one, BA/BFA students pursue both. Founded in 1919 by those who imagined a school that would rethink the purpose of higher education, The New School has a history of challenging students to honestly and directly address the problems facing societies worldwide. The courses offered by The New School at first reflected the founders’ interests in the emerging social sciences, international affairs, history, and philosophy. Some of the finest minds of the 20th century developed pioneering courses at The New School. The New School also became known internationally for courses in the creative arts taught by some of the 20th century’s most innovative artists. The New School has evolved continuously through the years in response to changes in the marketplace of ideas, career opportunities, and human curiosity. Parsons’s academic center in Paris offers undergraduate degree programs taught in English. Guided by a faculty of professionals from Europe and New York, students at Parsons Paris use the city as a laboratory, collaborating on creative projects and exploring ways to apply art and design to the challenges of urban life. The cost of attending The New School varies from program to program and sometimes from student to student. Many of the students attending a degree program at The New School take advantage of financial aid. US citizens or eligible non-citizens must complete the Free Application for Federal Student Aid (FAFSA), and undergraduate degree-seeking international students interested in grants or scholarships from The New School should complete the Undergraduate International Student Scholarship Application. For forms and more information, please visit newschool.edu/student-financial-services/apply-for-aid. During your time as a student at Parsons, academic advisors will help you develop the skills, confidence, and industry contacts you need to succeed. You will participate in internships and job fairs, receive personal career counseling, access an online job board, and attend career development workshops. When you graduate from Parsons School of Design, you will become a member of one of the best professional networks in the business. You will know you can always count on your college friends and instructors for creative inspiration, career advice, and personal support. Attending Parsons School of Design will give you something in common with Donna Karan, Tom Ford, and Edward Hopper: you will all be alumni of the same college. The list of notable Parsons alumni also includes Donald Brooks, Mario Buatta, Sue de Beer, Peter de Seve, Angelo Donghia, Ian Falconer, Albert Hadley, Victoria Hagan, Lazaro Hernandez and Jack McCollough of Proenza Schouler, Marc Jacobs, Jasper Johns, Reed Krakoff, Claire McCardell, Ryan McGinley, Steven Meisel, Isaac Mizrahi, Norman Norell, Paul Rand, Norman Rockwell, Narciso Rodriguez, and Anna Sui.